For adults, blend 3 x 60ml scoops to 250ml of water, juice, milk or yoghurt. For best results, use an electric blender and once mixed the product should be consumed within 20 minutes. You can drink MET-Rx® Supreme Whey any time during the day to add extra high quality protein to your daily kilocalorie intake. Be sure to figure the extra kilocalories provided by milk, juice, yoghurt, or whatever you may add to your MET-Rx® Supreme Whey. Ensure adequate hydration during and after training - Minimum of six to eight glasses of water daily. Protein Blend (Whey (<strong>Milk</strong>) Protein Concentrate (WPC80), Hydrolysed Whey (Milk) Protein, Whey (Milk) Protein Isolate), Maltodextrin, Emulsifiers (Soya Lecithin, Acacia Gum), Cinnamon Powder (Maltodextrin, Corn Starch, Glycerol, Sucrose, Molasses, Cinnamon Flavouring), Starch, Sweetener (Sucralose), Vanilla Flavouring (Sulphites), Sucrose, Vegetable Oil, Lactoperoxidase (Milk), Vitamin C (as Sodium Ascorbate), Vitamin E (as dl-Alpha Tocopherol),Colour (Beta Carotene), Anti-Caking Agent (Silicon Dioxide), Tricalcium Phosphate. 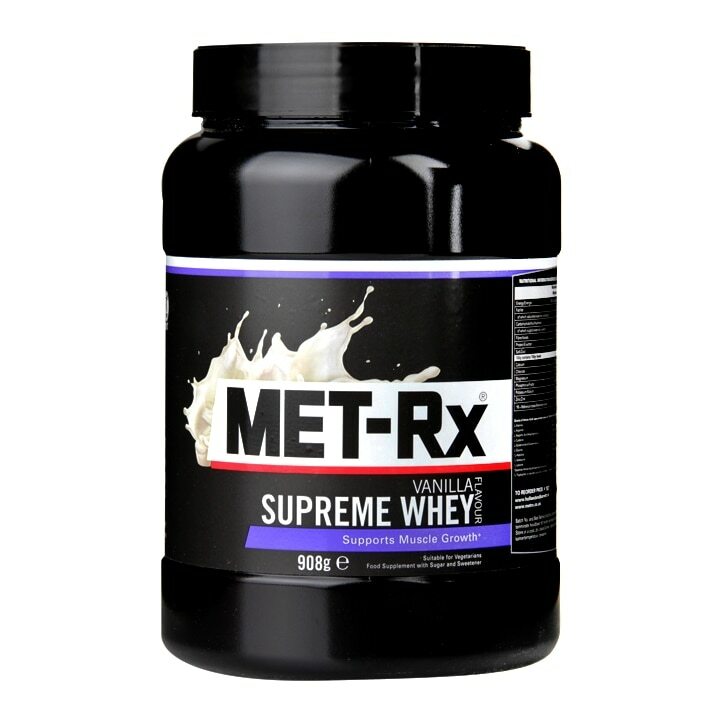 Met-Rx Supreme Whey Vanilla is rated 2.8 out of 5 by 4. Rated 1 out of 5 by RealWideback from I want a refund I've tried many brands of protein shake - this ranks at the bottom (hench the need to leave my feedback). The branding is similar to 'USN Muscle Fuel Anabolic,' so suggests a similar product but it doesn't even come close... My method is to mix with water, rather than milk. This powder doesn't mix/blend well, it forms lumps that you have chew your way through, followed by gritty residue towards the end. Flavour is not nice; 'chemical' taste. I've made 4 shakes from my tub so far, and do not look forward to having anymore of this product. If there was a money back guarantee on this, I would certainly be making a claim. Rated 1 out of 5 by clairebcp from Not good at all!! Absolutely disgusting, tastes of chemicals! Fully offended my pallet! Vile stuff! Rated 5 out of 5 by Ronnie123 from Met-Rx Supreme Whey Vanilla Bought about a week ago & I'm extremely happy with my purchase, definitely value for money after seeing the size of the tub as well.